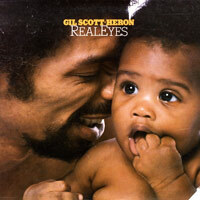 Gil Scott-Heron’s passing is hitting me almost like the death of someone I knew personally. I guess what I mean is that his influence in my life was so broad that it wasn’t really possible to comprehend its magnitude until I had time to move through different aspects of my daily experience and notice how many of them suffered from his absence. I’ve been thinking about why that should be the case, and the answer certainly includes all the things others have noted: the politics, the humor, the style, the attitude, the voice, the influence. But there’s something else, too, and I think it’s this: It’s easy to write positive songs if you believe the world is all sunshine and roses. What’s hard is to write positive songs when you know better. Don’t get me wrong: I love purely optimistic music…It’s just that sooner or later I always start to feel like I’m lying to myself. I told them all to keep the hell away from me. everything I do gon’ turn out wrong. but the sunshine always seems to stay. The only people who can choose not to believe that everything is going to turn out wrong are the people who suspected it might in the first place. And a person who would tell the shadows to “keep the hell away from me” has a very different outlook from a person who lives in a world without shadows. Gil Scott-Heron lived in a world that was full of shadows. A world that was full of grey areas and second-guessing and backsliding, of both the personal and political varieties. But that’s precisely why you could trust his songs. Because that’s the world. Don’t seem to matter much now just what I say. You the kind of man who think he got to have his own way. You’re my father; you’re my uncle and my cousin and my son. I wish you were none. and I’ll say, “Peace go with you, brother”. But Gil managed to smile. He transcended his own ambivalence. Nor does the human spirit move without great difficulty against all the apathy of conformist thought within one's own bosom and in the surrounding world. Moreover, when the issues at hand seem as perplexing as they often do in the case of this dreadful conflict, we are always on the verge of being mesmerized by uncertainty. But we must move on. As someone who is “mesmerized by uncertainty” pretty much on a daily basis, I know what he was talking about. And so, clearly, did Gil Scott-Heron. He didn’t ignore that. He didn’t minimize it. He didn’t make you feel like there was something wrong with you for not being completely sure about things. But he didn’t let you off the hook, either. Finding that balance, after all, is not only the essence of being an effective activist. It’s the essence of being a decent human being. Gil Scott-Heron made music for decent human beings and, by doing so, he encouraged each of us to become one. Hard to imagine, working in the mine. Coal dust in your lungs, on your skin, and on your mind. Here come the mine cars, and it’s damn near dawn. Another shift of men, some of them my friends, coming on. and it occurs to me politicians don’t understand. Thoughts of isolation, ain’t no sunshine underground. Feels like working in a graveyard three miles down. That was almost twenty years ago, and the older I get, the more I understand the truth of those words. Lots of people sing about revolution, and some of them even do something about it. But how many of them keep you warm? Joseph Schloss, Ph.D. is the author of Foundation: B-boys, B-girls and Hip-hop Culture in New York (Oxford University Press, 2009), and Making Beats: The Art of Sample-Based Hip-Hop (Wesleyan University Press, 2004). He is a Visiting Scholar in Music at New York University and Adjunct Assistant Professor of Black and Latino Studies at Baruch College of the City University of New York.